HCM City (VNS/VNA) — The Ministry of Health has chosen three hospitals to pilot the IBM Watson for Oncology, an artificial intelligence (AI)-driven clinical decision support system. The hospitals are HCM City Oncology Hospital, National K (Cancer) Hospital in Hanoi, and Phu Tho Province General Hospital. The IBM Watson for Oncology system is used at 230 hospitals in 13 countries including the US, China, India, the Republic of Korea and Thailand, according to the HCM City Department of Health. IBM Watson operates with the professional expertise of experts from the Memorial Sloan Kettering Cancer Centre, which specialises in cancer research and treatment in the US. The system contains more than 100 million medical records, 30 billion photos, 15 million medical quotes and more than 40 million research materials. It helps doctors quickly identify key information in a patient’s medical record, surface relevant evidence, and explore treatment options. The system, which helps doctors offer protocols for optimal treatment of each patient, is used for 13 kinds of cancer. Dr Pham Xuan Dung, the head of the HCM City Oncology Hospital, said: “The system improves effectiveness in treatment at the hospital,” which uses it for breast and colorectal cancer cases. 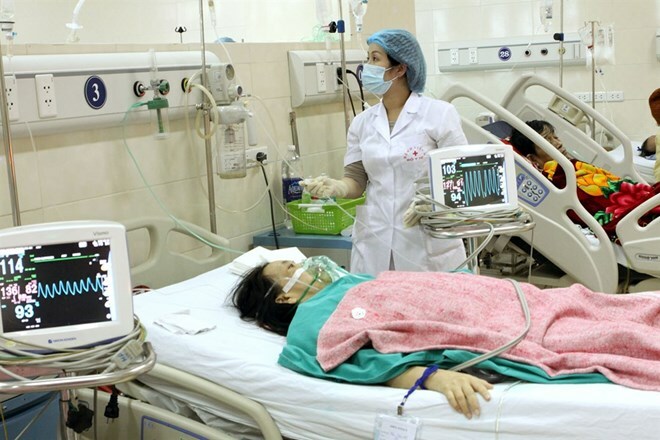 Dr Vo Duc Hieu, head of the hospital’s division for professional training, said the system had been used in 103 breast cancer cases and 126 colorectal cancer cases at the hospital. The degree of similarity between clinical protocols prescribed by the system and the hospital’s own protocols was 80.3 percent. “The system is used to treat most stages of breast and colorectal cancers,” he added. It also helps doctors learn about the latest new treatment protocols, and limits shortcomings in treatment, according to the hospital’s council of experts. Chemotherapy and endocrine protocols are included in the system. However, the database for the system in the US is in English and has not been translated into Vietnamese. “So the system cannot replace doctors who make decisions for treatment in real situations,” the hospital’s council of experts said. Hieu said the system often prescribed targeted drugs for HER2-positive breast cancer. These drugs work by targeting HER2 proteins or markers on or within cancer cells that promote cell growth. HER2, a human epidermal growth factor receptor 2 gene, can play a role in the development of breast cancer. “Most breast cancer patients treated at the hospital do not have finances that fit this system,” Hieu said. Several new drugs, for example, are not available in the country and their health insurance does not cover this system. The IBM Watson Oncology system prescribes fewer radiotherapy sessions than the hospital’s existing protocols. “The hospital needs to upgrade its facilities and equipment to be able to effectively apply the system,” Dung said. "In addition, doctors and other health staff need to be trained so they can make a decision on which protocol to choose." The hospital has asked the Ministry of Health to set prices on the use of AI for counseling and treatment and determine the percentage of health insurance coverage. AI is now being used for researching electronic medical records in the health sector, and the country’s database is updated once a month. The International Agency for Research on Cancer’s 2018 GLOBOCAN report found that new cancer cases worldwide had risen to 18.1 million in 2018, including 9.6 million deaths. Cancers of the lung, breast, colorectal, prostate and stomach were the most common.